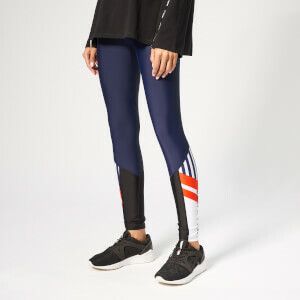 Women's 'Time Trial' 7/8 leggings from Australian activewear label, P.E Nation. Crafted from high-performance stretch fabric with colour-block stripe detail on the calves and blue piping along the legs to create a form-flattering silhouette. Cut in a compression fit, the high-rise tights feature flatlock seams to increase durability, and a wide reinforced waistband for enhanced core support during workouts. Squat-test approved with zero transparency. Complete with embroidered logo branding.